Was Manardo Amandola's Robin Hood? 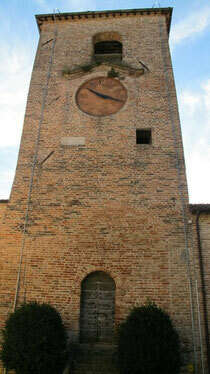 Amandola, Piazza Alta: The small, white square just under the clock face is where the words are carved. A bandit, a rebel, a rascal? Who then was Marnardo? An ancient document reports that "he was accused of arson, theft & murder; on November 17th, 1597, he was beheaded and butchered with eight other criminals in the square of Macerata and the following day his head was carried to la Mandorla (the old name for Amandola) and put into the tower." The popular tradition, tells instead about a handsome and sturdy man leading a sort of People's Army: a warrior from Sibillini. All the people in Amandola used to organise great dinners and wonderful dancers when he came back home from his adventures. All the women in Amandola were madly in love with this valiant man and they were ready to help him every time he had to flea through the secret undergound passages conecting Piazza Alta with the Tenna River. Well then, was Manardo a bandit or a hero?